Last year the Department for Education introduced new statutory guidelines for Assessment, which all schools must adhere to. ‘Assessment Trees’ for core subjects, pasted into workbooks, recording children’s achievements and progression over the course of the school year. CLICK HERE to read the document we produced to make sure parents are fully informed about the assessment procedures we follow in our schools. 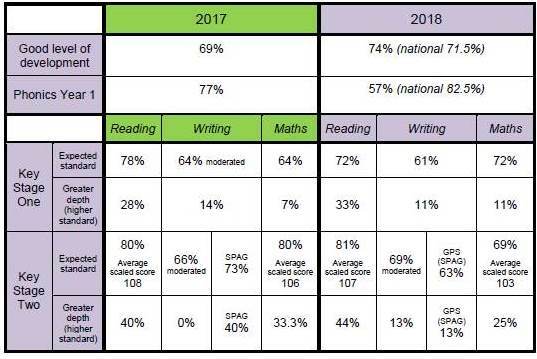 Below is a summary of attainment across our two schools, across academic years ending 2 017 and 2018.